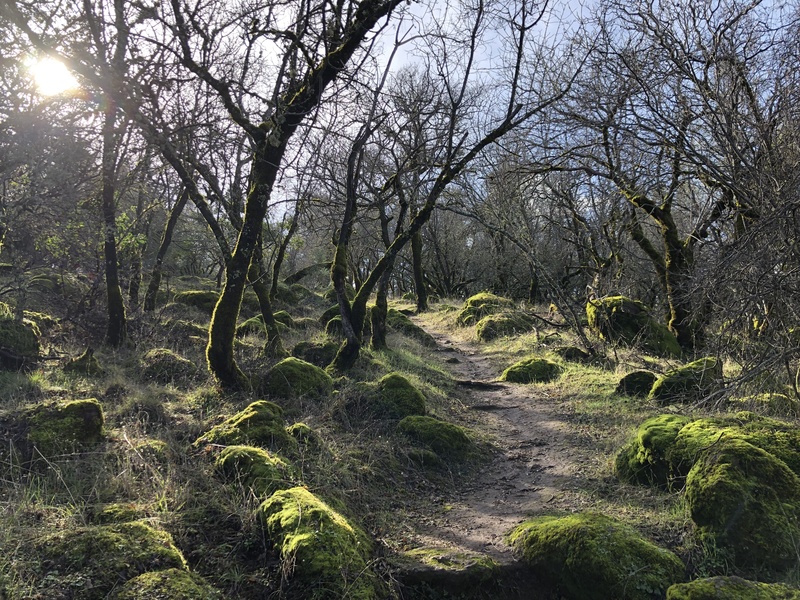 When winter rains soak the earth and bring carpets of fresh green grass to the slumbering coastal hills of California, they awaken something more . . . the fungi! These wild treasures spring up from the forest floor practically overnight, sending those of us who love to forage scampering into the woods to scour the musty duff for elusive culinary delights. There is a Zen-like quality to foraging. It is a sensory pursuit that requires keen vision, timing, patience and discernment. There are never guarantees you’ll find what you’re looking for, but when the stars align there is no better feeling than bringing home the bounty. I’ve spent many hours trudging through the wood, only to come up empty-handed at the end of the day. It’s all good though, since any day spent with Mother Nature is its own reward. Sometimes, if you keep your eyes peeled, you can get a lucky break when you least expect it. Such was my good fortune on a recent hike when I spied a large white mass growing on the base of a nearby oak tree. After closer inspection I was doing an ecstatic happy dance! 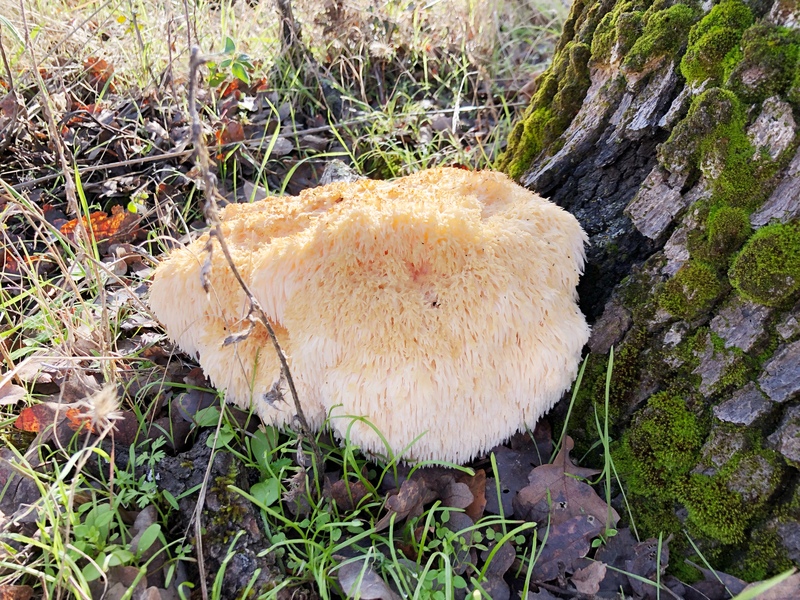 The mass was a giant Lion’s Mane mushroom; a delectable member of the “toothed” fungi family which is easily identified by its dense hairy beard. It is a meaty mushroom with a firm texture and mild flavor reminiscent of seafood. This beauty was as big as my head, and weighed in at a little over three pounds! Quite a score indeed. 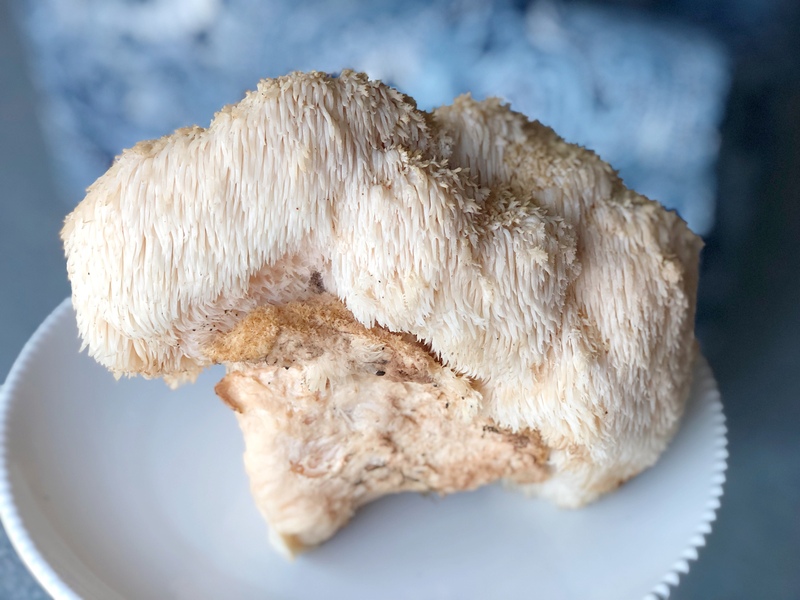 In addition to its delicious taste, Lion’s Mane is also a powerful medicinal mushroom that has been prized for centuries in traditional Chinese medicine for its ability to boost cognitive brain function, and stimulate the production of nerve growth factor (NGF) cells. These neuropeptides can help improve mental focus, and ease the symptoms of neurodegenerative diseases like Alzheimer’s, Parkinson’s and dementia. Lion’s Mane has also been proven effective in reducing anxiety and depression, as well as enhancing immune system function. Foraging is a practice as old as mankind. It taps into our ancient instinct as gatherers. A word of caution: Looking for wild mushrooms is Mother Nature’s greatest treasure hunt . . . as long as you can identify what you find. Mistaking a poisonous mushroom for an edible one can have tragic consequences. Learning the ropes with a seasoned forager is a must! Never, and I can’t stress this enough, eat any wild mushroom unless you have identified the variety with 100% certainty. I highly recommend contacting a local mycological society near you (mycologists are fungi experts in identification), to sign up for a field class with a professional. 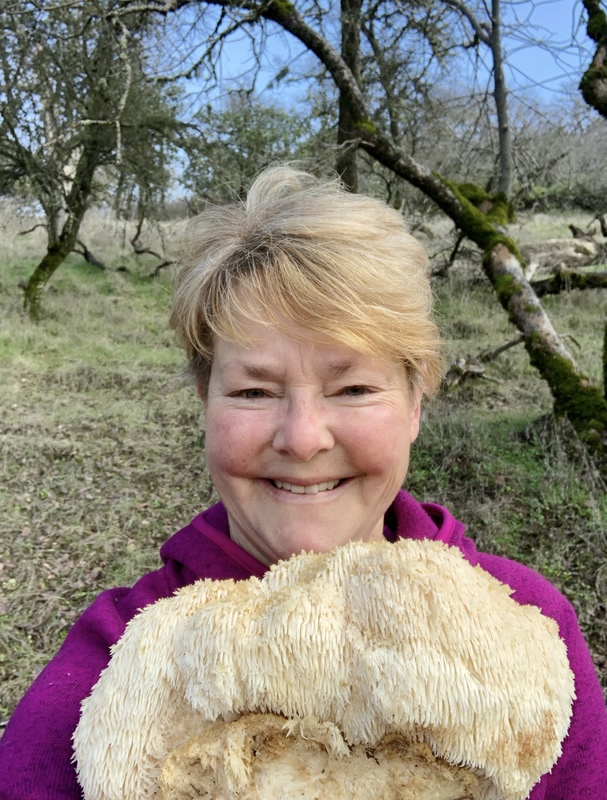 In the Bay Area, good options are offered by the Sonoma County Mycological Association, and Forage SF which offers forays in San Francisco and East Bay counties. I also suggest getting a copy of David Arora’s pocket field guide, All That The Rain Promises and More, which is considered one of the best in publication. My recipe search for cooking Lion’s Mane turned up several ways to enjoy this mushroom (including using it as a substitute for crab in crab cakes), but ultimately I decided to make a rich, creamy bisque to showcase its nuanced seafood flavor. If you’re lucky enough to find this fabulous fungi, I highly recommend making a big pot of this soul-satisfying soup. Gently clean the mushrooms, removing any dirt or debris with a soft brush and damp paper towel. Roughly chop them. Set aside. In a large stock pot, melt the ghee over medium-low heat. Add the garlic and onion. Sauté, stirring occasionally until translucent and just beginning to brown (about 4-5 minutes). Add Lion’s Mane mushrooms and parsley. Continue sautéing for about 6-8 minutes more, or until the juices released from the mushrooms have evaporated. Gradually stir in the bone broth until incorporated, and bring to a boil. Reduce heat to simmer. Use an immersion blender to thoroughly purée the soup. When smooth, slowly blend in the sour cream. Season with salt and pepper to taste. Serve with crusty sourdough bread and a glass of chardonnay for a perfect meal! Wow. Nature at its finest. Indeed Jovina! Wild mushrooms are a delicious seasonal treat, and this substantial find is one I will long remember. Looks fabulous! Now I just need to find some!!! I bet there’s a mycological society on the Central Coast that hosts public forays Pandora. A great way to get started!